I ordered the thumb piano kit for my husband for Christmas and he loves it! Beautiful pieces and clear instructions. Great product! I am absolutely loving the thumb piano kit. Years ago, in 2007, I purchased the Voyageur harp kit for my high school senior project and I missed the instrument building experience in college. To get back into the swing of things, I'm making this thumb piano for a friend and am refining my pyrography to lightly burn some celtic knots into the beautiful cherry soundboard. Thank you for making such wonderful instrument kids! I am totally enjoying the process. Thanks for asking. It's been a pleasure dealing with your company. For Christmas last year I built seven Kalimbas to give as gifts. It was fun around here on Christmas morning. My 25 year old son really took to it. 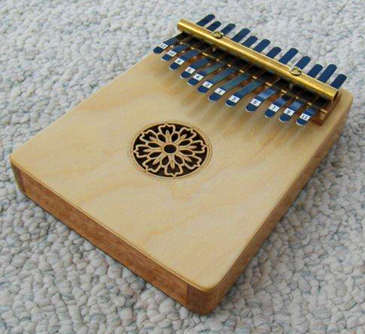 Here's a Youtube link of him playing his adaptation of Pachelbel's Canon in D.
I didn't actually order your kit or a finished Kalimba but just figured out how to build them by looking at pictures, mostly from your catalog and web site. I did, however, purchase the prong material from you. My wife wants me to build your suit case bass next. I think I might order your plans next Fall for that. I completed the thumb piano and it will make for some fun when the grandchildren visit. I had a little trouble tuning the two outside notes until I loosened the screws on the clamping rod just slightly. Having the screws too tight caused a plunking sound. Actually we are pleased with the results and it will make a great conservation piece. I also have made the bowed and hog nosed psalteries and we really enjoy playing church hymns on them. For the future, I am considering making the Strumbly, but being not very musically talented I have concerns about learning to play it. I enjoy making your kits.